In life, you can make a negative first impression in all sorts of small ways — a weak handshake, your inability to tie a Windsor knot for men, raggedy nails or eyebrows for women — but in 2015, that first impression is more likely to take place online. So whether your business engages in e-commerce directly or not, it is crucial to have a high-quality website for potential clients or customers to land on. By 2011, more than 1 trillion in sales were influenced by the Web, a number which increased even during the recession. Unfortunately, many prime domain names have already been snatched up, which is why many companies are forced to use clunky and awkward domains. Generally, you will be limited to a domain between 26 to 67 characters long. Even so, website design experts say domains with 20 characters or less are optimal; they’re both easier to remember and type for new users. Have You Purchased The Right Web Hosting Plan? You should select a web hosting plan that gives you at least 20% more capacity than you currently need, that way you’re covered in the event of a traffic surge. Plus, it’s always best to plan for some future growth. 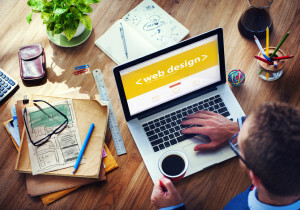 Does Your Web Design Plan Include Content? Many webmasters think that content has nothing to do with their business plan, but it can help increase your search engine optimization — your ranking in search results for business-specific keywords. Ask your web designer to include a blog on your website, even if you don’t know how often you can update it. Many users are more likely to share visual content, and 70% of digital marketing agencies plan to use original visual content this year. And if that content gets shared on social media, it could also help boost your SEO performance. Four out of ten users will push the back button if a website takes just three seconds to load, and that’s why Google actually penalizes sites that take longer to load. If you already have a website online, check and see how your pages are loading. Remember: your home page should have useful information easily accessible. You only have 10 seconds to make that first impression online, so your site’s visitors should be able to find exactly what they need without unnecessary clicking or scrolling.